Olivier Résimont’s main target is linen from high-end hotels and high-end elderly homes in the Brussels region and Wallonia, Belgium. In his case, he deals with a wide variety of linen, as he handles personal linen, bed linen, table linen, and towels with an average hourly production capacity of 660 lb (300 kg). The Résimont Laundry has been able to increase its production every year, even during the past difficult years of economic crisis. As the crisis diminishes, demand is strongly increasing. To be able to continue growing, the laundry needed to raise its production capacity, streamline its production and reduce labor costs. Up to now, the laundry has only been working with open-pocket and barrier stand-alone washers having an average water consumption of about 2.28 gallons per pound (19 L/kg). As time went by, and with costs of water, energy and labor continuing to increase, Olivier Résimont started to focus on improving the work-flow and efficiency of his plant, looking for new and better solutions. The diversity of linen with which he is used to had prevented him from investing in a continuous batch washer in the past. Mench Industry, Milnor’s Belgian distributor, had encountered Olivier Résimont when selling him his latest ironer in 2015. Mench also suggested investing in a rail system with an automated “express track” option, manufactured by Wilgengroep, in order to keep as many batches of compatible linen together as possible. The rail system improves traceability and makes it possible for one person to sort the linen, automatically load the CBW® washer and unload the extractor. “It means that we can change completely the type of linen while only letting at most one empty compartment between two different types (colors) of linen,” says Stéphanie Bouchat. Due to the reliability of the machine, high quality and constant production is achieved. The wash process begins with the PulseFlow CBW, which is loaded by an automated soil rail system. The RecircONE® first module recirculation feature quickly wets down the goods and allows the chemistry to start its job in the first module. Milnor can already remove approximately 60% of soil from the linen in the first compartment. By adding a Milnor PulseFlow batch washer to this laundry, productivity has increased significantly. 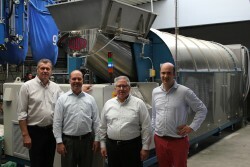 “The Résimont Laundry has gained efficiency in laundry processing by both increasing the amount of linen processed and reducing operating cost, including water, energy, chemicals and the overall labor required to load/unload washer-extractors,” says Steve Bosteels, operations manager of Mench.